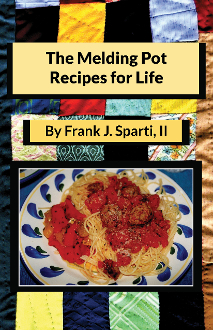 The Melding Pot Recipes for Life is more than a memoir or list of recipes. It is the epitome of our nation’s core experience, in which two people with vastly differing ancestries meld together their family customs to become one, sharing historical recipes and creating a blend of the best of each for the future. Witty and touching, this book is about family and love as conveyed through truly appetizing stories centered around food, family and friends. Inspired after reading M.F.K. Fisher’s, The Art of Eating, Frank Sparti wrote twenty-six essays drawn from his family food experiences. He combined the essays with stories from his wife, Betty’s family and an expanded version of their recipe book written together in 1999. These recipes now include some from their son, Joseph, a great cook, family man and the best combination of Frank and Betty Sparti’s union. If seeking a good life is your goal, The Melding Pot Recipes for Life is a good place to start.